As a business owner things toady are more complex then ever before. Two of the things that every business today must deal with are customer complaints and scams of all sorts. Luckily there are experts available to help you find your way through the minefield of today’s economy. A premier leader in the fields of protecting businesses from scams and complaints, Marcus Evans. The Marcus Evans company has held more then a thousand conferences attended by many top companies, business managers and CEOs. What can the Marcus Evans bring to your customer satisfaction issues? They focus on customer feedback and most importantly customer retention. Nothing will cost you customers as fast and as permanently as bad customer satisfaction. The other focus of Marcus Evans educational and conferences is how to protect vs. scams and scammers. The marcus evans rip off conference and training has helped many companies. The most heinous and hardest to address our online scams and especially hackers. With the huge importance of the internet you must be protected. We droved down to Bentonville, Arkansas to try a Latin cuisine restaurant for our lunch. When we arrived at the restaurant we noticed on the sign that they are serving Italian foods. We don’t need pasta meals so we decided to go to Gold Town Sushi and Korean BBQ. My husband and I both liked our food plus they have a good customer service. 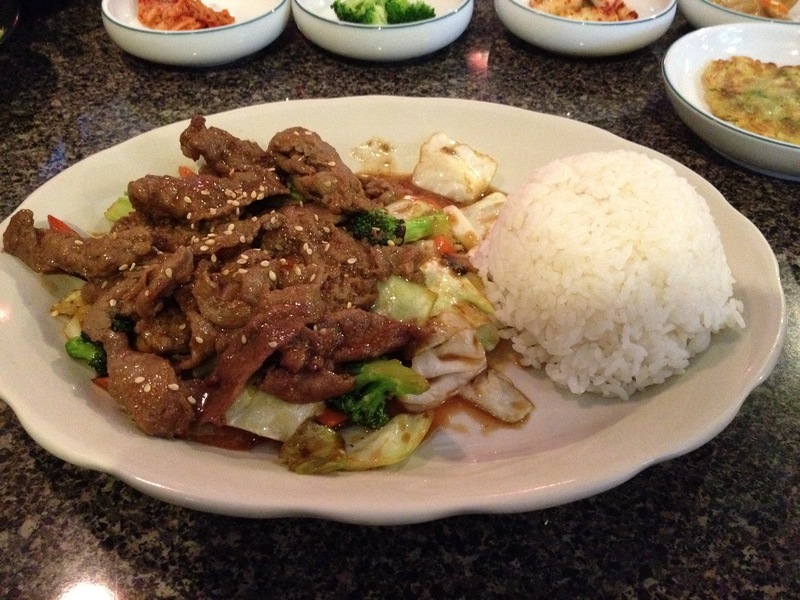 I ordered Beef Teriyaki and it tasted really good. We will definitely go back to this place again. My sister in-laws are coming to visit next week. I think it is a good idea to take them to this Korean restaurant when they visit us next Friday. My husband’s sisters like to try to eat different foods every time they visit us and hopefully they will all like the restaurant just like my husband and I did. Then we stopped by at the Flea Market and Charles got some collectible cars for a great price. Charles also had his haircut today and he really looks more handsome. What can I say, he’s my boy and I am a very proud Mama! I weighed 96 pounds before I got pregnant. And now every time I step on the scale I don’t like seeing the three digit numbers showing on the scale. I have never really tried to lose weight and I eat what I really want especially when I cook foods that I used to eat when I was in the Philippines. I know this is not a good thing and I want to be a great example for my son Charles. Over the last few months I have been thinking of what’s the best possible solution and ab belts are one of the best ways to have a flatter stomach. I felt awkward the first time I wore my swim suit just a couple of days ago when we went swimming with my sister-in-law Connie and her husband Max. In just a few days, all of my husband’s sisters and their cousin Linda are visiting us and we are going to go swimming again. All I want for myself is to be confident of my own skin and not to worry every time I wear a swim suit. Summer is already here and we surely have a lot of fun stuff to do. Sunday Doug got a Redbox rental. He got an email from Redbox saying all movie rentals were fifty cents off last weekend. Considering that they usually cost just $1.25 fifty cents off means movies are only seventy five cents. Well Doug decided to get the movie Chronicle as one of his friends Joe suggested it to him. I did not care to watch the movie so Doug set to watch it early Monday morning while Charles and me were still asleep. Ends up the DVD was broken. Doug called customer service at Red Box and they gave him two free rentals for calling about the broken DVD. That was great service and he really appreciated it. I have found Redbox easy to use and they are everywhere around us. No wonder old Movie Rental stores like Movie Gallery and Blockbuster have taken such a big hit. We like the price and availability of Redbox and will keep using them. Just a few days away and June is coming to an end. I can’t believed we’re halfway through the year and my son Charles’ birthday is just few months away. Charles will be four this September and I am amazed how he has became a kid and not a toddler. Last night, my husband, Doug and I were looking at his pictures and we were smiling on his pictures. Brings back a lot of memories from the time he was conceived until now. The thing that I was worried about when Charles was little was what if when he can’t talk or being sick all the time? Soon as I heard his first word which is “dada” it was sign of relief. Charles is very healthy from birth until now and I am very proud of myself for taking such good care of my baby. There are upside downs of raising a kid especially on his age now and I know I can get through it. My husband is very supportive and knows how to handle Charles when situation gets bad. I know I am not the most perfect mother in the world but I am trying my best to be a good mother for my baby. One that he can be proud of when he gets older. Just two weeks away and we are moving to our new place. My husband and I are all excited and so is Charles. Our new place is located in a much nicer neighborhood and it has great appliances though we need to buy our own refrigerator. We did shop though shop for and found a refrigerator the other day. My husband and I both agreed that we like a side-by-side Samsung refrigerator at Best Buy. The other thing I noticed about our new place is it has a whitehall address plaque. The plaque looks nice as does our new place. Besides the great interior we are excited to move into a much better neighborhood. Even better for us is that it is close to my husband’s school. I can see our house number right away. Also my husband’s family and friends can easily find our new place once they visit this summer. We had a pretty good day today. My husband's sister, Connie and her husband, Max are visiting us. We had our dinner at The Catfish Hole, in Fayetteville and they really liked the food. Then we drove down to the Razorbacks Stadium and they also liked the campus. Tomorrow we are going to Crystal Bridges Museum of American Art. We just visited the place a couple of weeks ago but we haven't really seen the whole area so we decided to go back again. Then we are going to eat our lunch at AQ Chicken House as Father's Day for my husband. Other plans for tomorrow is we are going to go swimming at Residence Inn Marriott, where my sister-in-law Connie and her husband are staying. I'm sure Charles is going to love it! Its been awhile that we did not to a pool though I really don't know how to swim. Summer is just a few days away and I know how much you are all enjoying the weather. Me and my husband have been planning to go to Beaver Lake just to look around the area and have a picnic afterwards. I have never been to Beaver Lake but I think it is a nice area to spend time with your family. Lots of families are going to Beaver Lake and it amazed me that every family going there have their own boats and pontoons. If you’re planning to buy a new boat or pontoon you should know what are the pros and cons of owning one. Wilmington NC marine refrigeration has been around for years and is helping new owners provide quality service for any boat or pontoon. We finally found the house that my husband and I really both liked. And next week we are going to sign the paper works and purchase a new refrigerator. The reason why we are moving is our current neighborhood is too crowded and very noisy, plus the house next door to us is very trashy. How much worse would it be if we lived close to a manufacturing company? I can’t take too much noise just like when my husband Doug plays his X-Box. There are though solutions to having too much noise, soundproofing can be used in your home or business if you need quiet or need to make a lot of noise. Isolation technology of course is available on the business side. Vibration and noise can be a devastating issue for some manufacturing and businesses can run into. Vibration can cause damage to your business’ structure and the local environment if left unchecked. Law suits and zoning is also an issue. The local news covered a story where a small town south of us had a business with bad noise pollution. The city decided to change zoning laws to force the business to restructure its business practices. For the last couple of weeks now we have been searching for our next place to live with my family. Searching our next home is not that easy as I thought it might be. Luckily, our realtor is very understanding and helpful in looking for the perfect home that fits our needs and budget. So today, we found the house that my husband and I really like. Tomorrow Doug and I are going to submit our application for the home. Though we have to purchase a new refrigerator, that is okay we can make it work within our budget. Whether you are planning to buy a new home, commercial property for your business or a land for your dream home, http://www.bruce-germinsky-realtor.com is the site to visit. BG Realty Services are highly trained professional real estate agents and are willing to assist you with all of your residential and commercial real estate needs. Later this afternoon my husband and I are going to see another house. Hopefully we will all like what we see so we can submit our application on the same day. With moving ahead of us I have tons of magazine. Whether I should give it to our neighbor or take it when we move is a question. Maybe though I should keep them? I have found an interesting magazine rack and end table with built in lamp that I can purchase online. Also for my husband a 29 inch medicine cabinet and hardware to help in mounting larger mirror to simple box cabinet are on his wish lists. It is ideal to have a separate cabinet for his stuff and my stuff for our bathroom, plus I have a toddler who likes to climb up and get stuff. The items that we need are within our budget which makes them perfect. With the weather getting hotter shopping online is my preferred method. I always have a teary eye every time I see someone on the television that is making a difference for other people. Avnish Goyal is a Managing Director of Hemraj Goyal Foundation. he foundation is raising money to help people in need. Mr. Goyal started his career in the accountancy field. After a decade as an accountant though Mr.Goyal decided to enter into the business of running care homes. Since his youth he had dreamed of providing great service not to his bank account but to society. Starting as an 11 year old working for his parents and through his accounting career and later his family business. Mr. Goyal continued to gain skills and knowledge or organization and running an effective business. Since entering the care home field his company has been the leader in care, fundraising and most importantly humanity in his field. He has won many awards including being recognized by the Eastern Eye Asian Business Awards. Our friends at the Asian store in Springdale recently got a brand new scanner and printer for their store. They got their new set up at, POS Hardware. The set up is great and they love how it works and that it was cost effect even for a smaller store like them. As a customer I really appreciate how much it has made checkout easier and quicker.